Give friends and family a food gift they will truly appreciate this holiday season. This layered mix takes most of the work out of baking homemade cookies so they can just sit back and enjoy the tasty treats. 1 of 2 Have ready a clean 1-quart reusable plastic or glass canister. 2 of 2 In a medium-size bowl, stir together flour, baking powder, baking soda and salt. Spoon 1 cup of the flour mixture into a second bowl and add cocoa powder and cinnamon. Whisk to mix thoroughly. 1 of 3 Spoon about half the flour mixture into bottom of jar. Use a small spice jar to lightly compress. Spoon in half the cocoa mixture; compress. Spoon in remaining flour mixture and cocoa mixture, compressing each layer. 2 of 3 Top second cocoa layer with granulated sugar and brownulated sugar, compressing each slightly. Pour chips over sugar and seal jar. 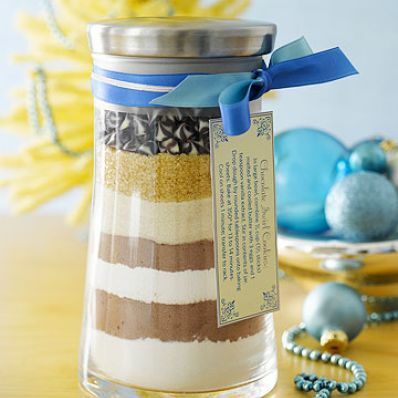 3 of 3 Write baking instructions on a tag (or print out); secure to jar with ribbon. 1 of 1 In a large bowl, combine 3/4 cup (1-1/2 sticks) melted and cooled unsalted butter with 3 eggs and 1 teaspoon vanilla extract. Stir in contents of jar. Drop dough by rounded tablespoons onto baking sheets. Bake at 350 degrees F for 13 to 14 minutes. Cool on sheets for 1 minute; transfer to rack. 1 of 1 Brownulated sugar can be found in your grocery stores baking section. Per Serving: 2 g pro., 130 kcal cal., 53 mg sodium, 1 g fiber, 3 g sat. fat, 28 mg chol., 6 g Fat, total, 19 g carb.